Shubham Inc is now exclusive partner of Biorock. Now worlds best Non Electric Sewage Treatment Plant is available in India. Looking for “Sales Partner / Distributor” in India for our Newly Launched Zero Energy – Sewage Treatment Plant. The best residential sewage water treatment system without electricity, zero energy. • Underground structure with compact design & completely covered plant. • No foul odour around the STP area or in the receiving environment. • Does not require continuous monitoring and operation. • Works well with inconsistent grey water flow. • Zero liquid from STP. • without electricity, zero energy. • Semi automatic and automatic plant operation. • Environmentally Safe to treated sewage water dispose in Land or Water. • Treated water can be reuse for gardening, toilet flushing, landscape, irrigation, cooling towers etc. Domestic & Residential Sewage treatment plants for Individual House, Weekend homes, farmhouse, Villas. Shubham Inc is now exclusive partner of Biorock. Now worlds best Non Electrical Sewage Treatment Plant is available in India. Weekend homes, farmhouse and villas have uneven supply of sewage is very less compared to residential building. Supply of domestic water is also limited. 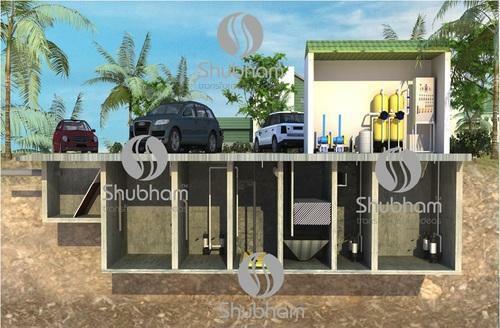 Shubham Inc provide a customized solution is used to collect, treat sewage water from an individual dwelling, villas, weekend homes and treated the sewage water up to reclaimed/reuse water quality and mainly reduce the manpower operation cost and daily maintenance cost. BIOROCK provides a revolutionary, efficient and reliable compactwastewater treatment solution. Very compact, our systems are free from any blower or air diffusors. They don’t need any electricity for the treatment process, leading to minimal maintenance and repair costs, the lowest operational costs and the longest desludge intervals. These unique advantages lead to significant costs savings for the user compared to conventional wastewater treatment plants, as the reliability of the system is maximized with no possible breakdowns thus no need for expensive spare parts. Providing you the best range of wastewater treatment plant with attached bio-growth, wastewater treatment plants, under ground wastewater treatment plant, moving bed bioreactor, frp sewage treatment plant and moving bed bio reactor mbbr with effective & timely delivery. Renowned among the best in the industry, we indulge us in manufacturing and supplies of an amazing range of Wastewater Treatment Plant With Attached Bio-growth under our Wastewater Treatment Plant gamut. These Machines as manufactured using latest technology are imparted with assured durability.The factory fitted and tested system along with semi / Automatic control panel includes full process Monitoring and data logging functions. Full telemetry including remote control is available as an option. The Bio-Accelerator 3600 is designed to require minimal operator supervision making it ideal for installation in remote locations.Priced very competitively, the quality of these machines proves a delight to our clients. The heart of the Bio-Accelerator 3600™ is design of aeration tank and bio-media as it removes organic impurities through a biological process. The biological process involves growing millions of bacteria that eat up organic impurities. Thousands of Virgin PP media pieces provide larger surface area for quick bacterial growth. Bacteria get attached to the surface of media-piece sand gets detached after attaining mass and age, giving room to other bacteria to grow at the surface of the media. Continuous and right supply of air through Diffusers provides mobility to the media and the sewage, for accelerated biological growth of bacteria… and provides vital oxygen for bacterial growth. The Accelerator 360o™ technology ensures that Food and Mass Ratio is continuously maintained uninterruptedly throughout the process for desired level of Mixed Liquor Suspended Solids (MLSS) which is critical for subsequent processes. The fully pre-assembled and factory tested Bio-Accelerator 3600™ modular Sewage Treatment plant is supplied in an ISO shipping container format for ease of transportation. Bioreactor, settling tanks & chlorine contact tanks are open topped with safety railings around access points. RAS Pump, aeration blower, dosing systems, Tertiary system, monitoring, and control systems are skid mounted and with effective weather protection. 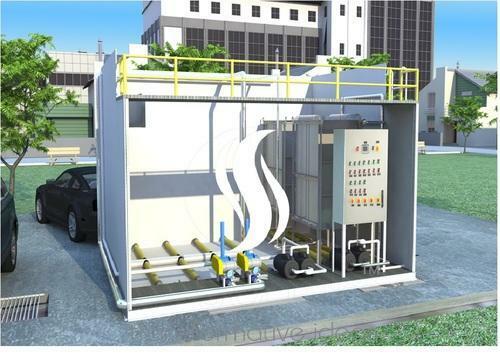 We at Shubham, Supplier Prefabricated Sewage Treatment Plant, we offer a variety of sewage treatment plant from conventional to innovative technology and modular to onsite treatment plant as per customer’s relevance and area availability as in Ahmedabad, Surat, Rajkot, Baroda, Gujarat and across the India. The factory fitted and tested system along with semi / Automatic control panel includes full process Monitoring and data logging functions. Full telemetry including remote control is available as an option. The Bio-Accelerator 3600™ is designed to require minimal operator supervision making it ideal for installation in remote locations. The heart of the Bio-Accelerator 3600™ is the design of aeration tank and bio-media as it removes organic impurities through a biological process. The biological process involves growing millions of bacteria that eat up organic impurities. Thousands of Virgin PP media pieces provide larger surface area for quick bacterial growth. Bacteria get attached to the surface of media-piece sand gets detached after attaining mass and age, giving room to other bacteria to grow at the surface of the media. Continuous and right supply of air through Diffusers provides mobility to the media and the sewage, for the accelerated biological growth of bacteria… and provides vital oxygen for bacterial growth. The Accelerator 360o™ technology ensures that Food and Mass Ratio is continuously maintained uninterruptedly throughout the process for the desired level of Mixed Suspended Solids (MLSS) which is critical for subsequent processes. The mixed- largely free of organic impurities, with controlled levels of BOD and COD, overflows to the next chamber for settling and filtration process. Treated Water reuse in irrigation and greywater applications. Reuse of Wastewater in a gardening application. From automobiles to food and retail business; from daily cleaning and washing to plain drinking, WATER is the No.# 1 resource that we need for sustenance. For years, we assumed that this resource is not just free, it will also last forever. We made irresponsible use of it and we now face the prospect of depletion due to massive-scale mismanagement and pollution caused by water. 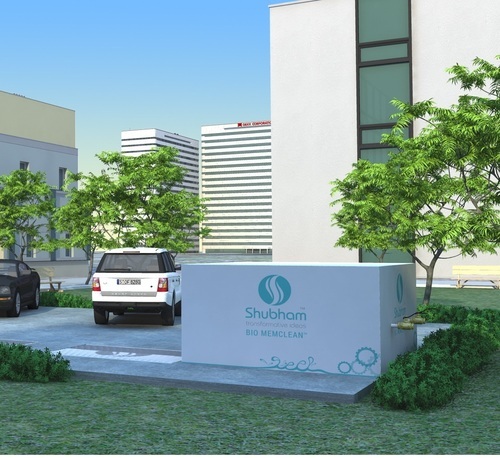 By considering environmental responsibility towards the water, Shubham Inc.has expanded its foray into Water and Sewage Water Treatment Plants. 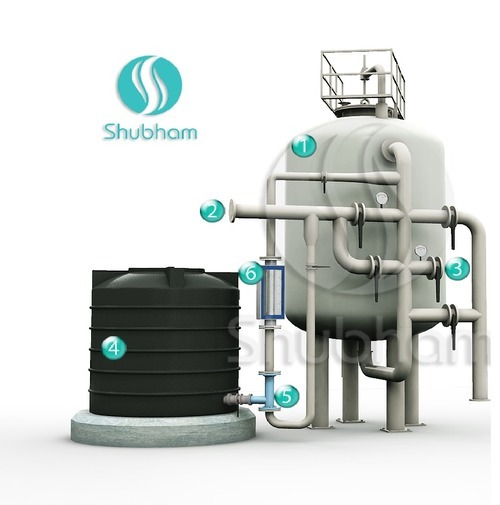 Shubham‘s product range mainly split into two markets vertical Water Treatment & Wastewater Treatment. We Shubham India are manufacturer and supplier of Sewage Treatment Plant and Water Treatment Plant products such as Industrial RO Plant, Ultra filtration Plant, Pressure Sand Filter, Multi Grade Sand Filter, Dual media Filter, Side stream filters, Water Softener Plant, Demineralization, Mix bed Unit, RO Plant and many more whereas Waste water treatment product range consists of conventional Sewage Treatment plant, Advance Bio- Accelerator 360[ MBBR ], Bio Hybrid [MBR], Package Sewage Treatment Plant, Underground FRP Sewage Treatment Plant, Septic Tanks, Grey Water Treatment, Laundry Water Treatment, ultra-Latest Electra-rapid (electro Coagulation), plant as an end-to-end service provider. We Shubham India also offer innovative solutions to communities that are serious about self-managing their water supply problems. Shubham delivers safe, cost-effective and sustainable water, wastewater and energy utility infrastructure solutions to businesses and communities across the countries who are interested in minimizing their carbon footprint. Water is considered ‘hard’ when it has excessive levels of calcium and magnesium dissolved in it. Water softening plant is used for removal of totalhardness dissolved in Water. We, at Shubham offer Series of water softenersat a low cost, reliable and highly efficientway to soften your water. Our unique design of Water softening plant ensures the maximum utilization of the effective surface area,uniform space and linear velocity across the resin bed which provides effective contact time between water and resin bed yield soft water and prevent any precipitation and scale formation on the surface of heat exchanges and any process equipment where water is being used for further application. Shubham water softeners are available in diameters from 0.225 Mts. to 4.0 Mts. with the flow ratesup to 250M3/Hr. and OBR up to 2200 M3@400 PPM hardness. These Strong, pre-engineered, pre-assembled units minimize installation land startup costs. Our Water Softener Plant is acclaimed in the market for cost efficiency and consistent functioning. Water softening is a process where Calcium and Magnesium ions are exchanged for Sodium ions. Calcium and Magnesium ions associated with Alkalinity contribute for scale formation. These ions are also called as Total hardness. The strong acid Cation exchange resin in Sodium form is used for softening the water. When the resin is exhausted, it is regenerated with brine solution (Sodium Chloride) 10 % or 15% brine solution is normally used for the regeneration. If the brine solution is passed from the bottom of the resin and service flow is from the top, then it is called as Up flow softener. If the service and regeneration flows are from top to bottom, then it is called as down flow softeners. The softeners are run up to the Hardness slip of 5 ppm as CaCO3 in the treated water, which is called as Industrial Zero hardness. Now days in hotels, hospitals, resorts and many other commercial sectors Sewage Treatment Plant is one of the most important facilities and In these sectors the space constraint is one of the common concerns. By considering this points Shubham is offering an Underground STP. Membrane bio reactor (MBR) : Membrane Bio Reactor (MBR) system, designed to achieve high quality effluent within a small overall footprint. The MBR process utilises the well proven activated sludge process, but replaces conventional final settlement with an ultrafine membrane which effectively filters the final effluent. The membrane is an extremely effective solids separation device. High removal efficiency results in a very high effluent quality (2/2/0.5mg/l or better). We, At Shubham, by the profound experience in this field of water and waste water treatment, we are involved in manufacturing, supply, erect most appropriate compilation of sewage treatment plants. We, At Shubham, By the profound experience in this field of water and wastewater Treatment, we are involved in manufacturing , Supply, Erect most appropriate compilation of Sewage Treatment Plants. 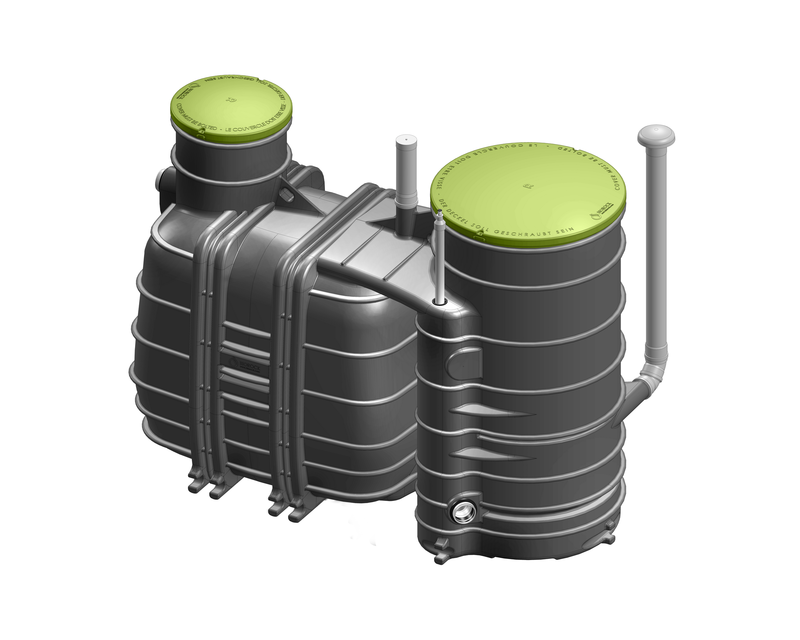 Bio Memclean™ is an advanced ‘plug and play’ modular MBR wastewater treatment system featuring the submerged MBR ultra filtration modules. The Bio Memclean™ is engineered to provide a high quality effluent, treated to Class A standards and suitable for a variety of reuse applications. The fully Pre-assembled and factory tested Bio Memclean™ modular plant is supplied in an ISO shipping container format for ease of transportation. Primary and bioreactor tanks are open topped with safety railings around access points. Permeate pumps, aeration blower, dosing systems, monitoring and control systems are housed in a lockable control room located at the front of the plant. Bio Memclean™ Membrane Bio Reactor (MBR)can best be described as one part of a biological process where small microbes degrade pollutants before being filtered by a collection of submerged membranes. Membranes are housed in modules that are, in turn, assembled into cassettes and installed in a tank (called an MBR). Air introduced through integral diffusers scours membrane surfaces during filtration, mixes the tank and provides oxygen to the biological process.